The N.C. Chronicles. : We just hit 10,000, and the reason why. We want to thank our readers for the support of this blog, we just hit 10,000 hits today, believe me it is a big surprise. What began as a simple personal blog on native thoughts and issue has become more. We do not "impose" our will on anyone, we try very hard to provide information on the current events, the corruption and attacks on what makes a safe nation and society, the family, and offer this info in order for people to be informed and make up their own minds. We do not subscribe to conspiracy theory, or that the Creator will smite us all, but we do subscribe to the idea that whatever happens, will be of our own doings. We have reached an impasse in our society, greed, personal power, adults lack of responsibility towards children, military adventures for natural resources, just to name a few, has reached its limits. It can no longer be sustained, it is causing untold problems and an irreversible situation. The change is coming, whether it is done by understanding and acceptance of each other place in the circle, respect for personal freedom and humility, or by violent action, only time will tell. But....in my experiences, those with power, do not give it up so freely, what will happen will be up to them, will they accept the changes and follow, of will they fight us? To those who believe themselves the "ruling elite" your time has come and gone, you had your chance and look what you did with it. Children are sick, crying, starving, dying, and you sit comfortably behind your protected mansions, thinking of ways to increase profits and power. That said, this is why this blog exists, to expose the fact that we, individually, if we accept our importance to the web of life, can make things better. But depend on others, and you will be imposed someone else idea of life. This is not about left or right wing politics anymore, this is about been human, compassionate, loving, and responsible. 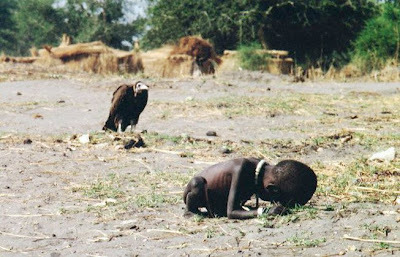 I could put realistic photos of what war and greed really does to children, but they are to horrible, instead I will post this photo, which tells us what the result of indifference does. Powerfull words and realistic, thats why I love this blog. Good words, I wish everyone thought that way.